Reduced Price! Owner is MOTIVATED! Reasonable offers will be considered. Turn key ready for the summer season!, freshly buffed and waxed, 50X14 Gibson Standard House Boat. Featuring master suite in back and twin cuddly up front, pull out sofa, (sleeps 8) Two heads with one having roomy full bath tub/shower. 12.5 KW 100 AMP Westerbeke generator (approx 200 hrs and enough to power for a washer and dryer), back deck rebuilt in 2016, new gel coat and fly bridge in 2005, new Bimini top and front Eisenglass, 454 Crusader engines approx 300hrs, Covered slip at Prizer Point Marina is available to assume lease-paid out to February 2018! Everything comes with boat needed to enjoy including furnishings. Owner hardly uses boat and is ready to sell! United Yacht Sales New Jersey would love to guide you through a personal showing of this 50' Gibson Standard 1985. 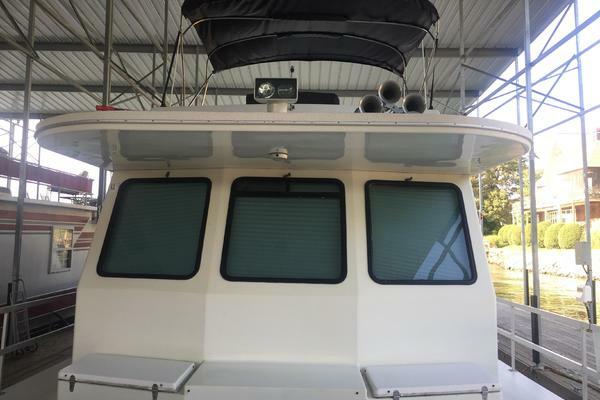 This yacht for sale is located in Cadiz, Kentucky and priced at $59,900. For a showing please contact us by filling out the form on this page and we will get back to you shortly!